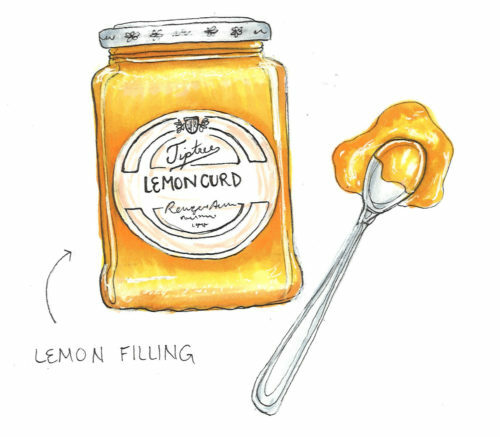 Whatever you like: sometimes I use lemon curd or raspberry preserves. Chocolate pairs well with anything! Just stick something tasty between the two cakes. Preheat the oven to 350 degrees. Butter and flour your cake-baking dishes. And I mean really butter those babies up! These cakes can really stick into their pans after baking. Once you finish buttering you should be thinking, “Did I butter this too much?” After buttering, add a spoonful of flour to the dish. Swivel the dish around so that the flour coats all surfaces. Then turn the dish on its side and tap the dish so any excess flour falls out. Melt the chocolate with the butter. The proper technique is to add about an inch of water to a sauce pan, bring it to a simmer, and then melt the chocolate and butter in a bowl above the water (i.e. double boiling). If you’re like me and like to live on the edge and/or don’t have a dishwasher and don’t feel like washing an additional thing (i.e. lazy), then melt the chocolate and butter on the stove on the lowest heat setting, stirring constantly. Note: THE LOWEST SETTING. Overheating chocolate can cause it to seize, which is basically when it forms a gritty paste. It looks like chocolate that came from prehistoric times, frankly. If this happens then you just have to start over. After melting, turn off the heat and just leave it alone while you move on to blending like you’ve never blended before. This recipe is great for people who love to just blend the sh*t out of things. Blend the pistachios, flour, and salt in a food processor. Make sure the nuts are really finely ground. Pour this out into a bowl. I hope you enjoyed all that blending because we’re done now. Next, gently fold the egg mixture into the chocolate. After that, gently fold the nut mixture into the rest. Pour into the two cake pans. Bake for about 15 minutes, or until a toothpick inserted into the center of the cake comes out clean. Layer the two cakes with the filling in the middle. Spoon the glaze into the center of the cake and cover the cake. Place the madeleines onto the cake in a ring. Cover each madeleine with the chocolate glaze. 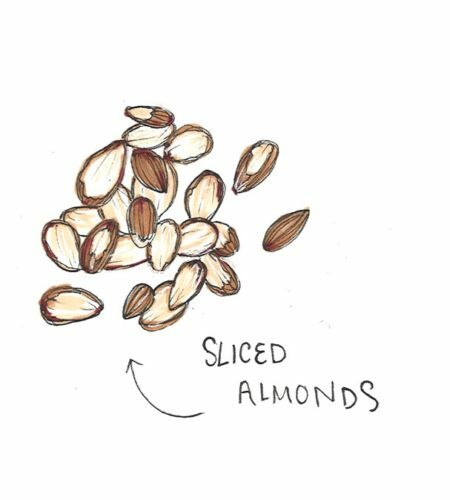 Place the almond slices onto each madeleine, starting from the bottom, then going up and around. 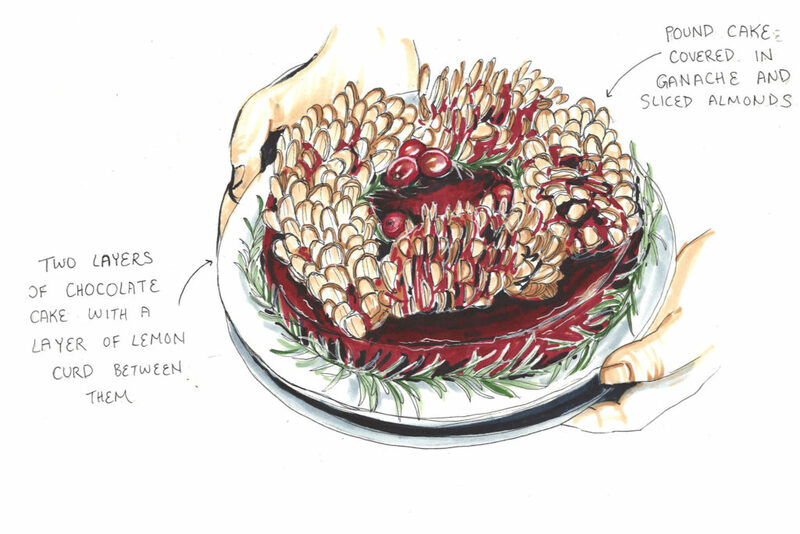 Finish the cake off by placing the cranberries and rosemary around the cake.